If there is one thing that I've been craving in my life recently it's been more balance. Between a hectic work schedule and running around from one event to the other, I've been craving some much-needed peace and quiet. However, when you feel stuck in a certain lifestyle, finding that balance is easier said that done and so as a book geek I turned to literature to help me with this. I looked at three completely different books to show me a different way; one delves into the science behind the power of resting, one is filled with fun and easy experiments to help me wake up the conscious part of my brain, and one provided a stimulating creative outlet. Did you know that over 80 per cent of the time you're awake you're spending it on autopilot? This book raises awareness of how the brain works and provides simple, hands-on mental and physical ideas to help you switch your brain into a more conscious state to and be more productive, energised, and aware of the world. Written in an easy to understand language and filled with ideas and experiments most people can turn their hand to, I read this book from start to finish in just two days and it left me full of inspiration for turning the every-day mundane around and finding more consciousness in my life. There are some things I am aiming to change immediately, but mostly I'll continue to dip and out of this book to do some of the experiments to help me look at things in a different light and approach life differently. The experiments are broken down into tune in, power up, and plug in, so you can select those that fit you personally or are suitable to a specific time in your life. There is also plenty of space for notes and to do the written experiments within the book itself – so you can create your own record of your journey to a more conscious life. It's an absolutely ace read and a must for people who, like me, can get swept away into the business of every day, and often forget to fully appreciate the world we're living in. Wake Up! is published by Penguin Books and retails for £9.99. This one is less hands on than Wake Up! and instead gets down to the nitty gritty of the science behind resting for a more productive and successful life. Though, while 'rest' is the main topic each of the chapters is focused around, the planned naps, walks, physical exercise and breaks laid out on the pages are actually designed to make the reader work harder and get more done in the limited hours we're given in a lifetime. They require early rising, short bursts of intense work throughout the day, and a carefully planned routine that allows you to be your best possible self. While some of the ideas within Rest were fascinating to read, for the most part it reiterated what many of us know; working a few hours steadily and then taking a break is more productive than working a very long day and tire your brain out, for example. Additionally, the book was filled with examples of great minds that followed the principles set out within the pages (such as Darwin's love for long walks) but there were far too many and the actual messaging became very repetitive because of this. That isn't to say that this book isn't interesting or useful, but I found it more enlightening by skimming through some of the key principles and picking up elements that suit me personally, than soaking up the scientific language and theories behind each of the examples touched upon, as they were just too bogged down in detail and saying the same thing again and again, and too little on practical ideas and use cases the every-day reader can apply to their own life. Rest is also published by Penguin Books and retails for £12.99. Last, but certainly not least, a book doesn't have to be a scientific read or filled with experiments to help you achieve a more balanced life. One that provides a creative outlet can also help relax, energise, and stimulate a different part of your brain. I've spoken about my love for colouring books many times before, but not until I came across this one (thanks to a win from the kind folks over at Abrams & Chronicle) have I found one that has been quite so inspired and filled with exciting things to try out. Rather than a straight-forward colouring book filled with beautiful drawings to colour in around a particular theme or topic, this one is a little more innovative and is filled with a wide array of projects for the user to play around with. Every day has an entirely new approach, from A Month of Favourite Things (in white and gold gel pens) to A Month of World Travel (with black and white pencil, and black pen). Here there are no pre-drawn images to fill in (except for the lush end papers), so you can let your imagination run wild. I also love that this book lets the user explore not only their creative side, but also provided a fun way to explore working with new materials. Not to mention that design and themes for each month are super cute too. 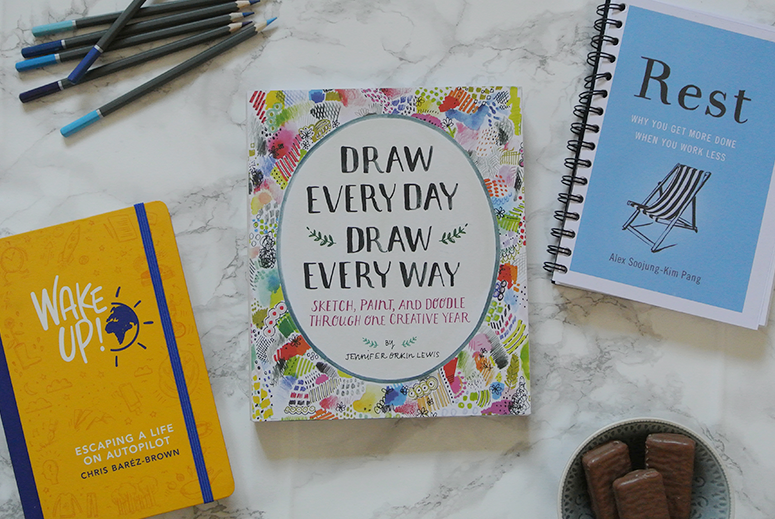 Draw Every Day, Draw Every Way is published by Abrams & Chronicle and retails for £12.99. And these are my recommendations for books to help you achieve a more balanced life! Do you have any tips or useful books to add to this list? Leave them in the comments below.